In three weeks my girlfriend and I will be moving up to San Francisco, where I hear it gets a bit cold. I had some extra yarn and decided I’d make her a warm gift. It’s super easy to make so I decided to share with you guys the pattern of how to make a nice simple button infinity scarf. Cut and tie off, sew in ends. Sew on two (or more) 1 1/4″ buttons to one side of the scarf. The buttons should fit perfectly between the dc bars while still holding in securely. That’s it!! See how easy that is? Took me about an hour to finish and about one whole ball of the yarn. It’s not too late by the way! Comment on this post, or crochet one of these and take a photo to receive extra entries in the Awesome June Giveaway! For other ways to enter click here!! 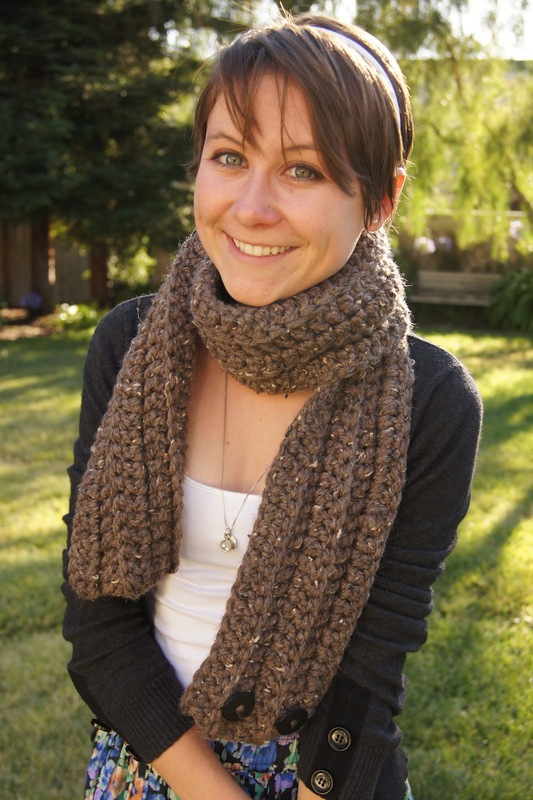 This entry was posted in Blog, Classic, Crochet, Free, Pattern, Scarf on June 26, 2012 by Louis Mensinger. This is cool. I love the option to have it infinity or open. Also love that it takes one skein! 🙂 Thanks for making it a free pattern!